THEODORE PARKER. Signed Book. 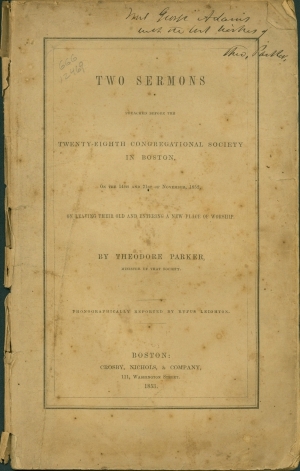 Two sermons preached before the Twenty-Eighth Congregational Society in Boston...On leaving old and entering new place of worship. Boston: 1853. 1st ed. 8vo. 56pp. Inscribed by Parker.